While examining water from a little lake near my home in Rotterdam, the Netherlands I suddenly stared into a huge eye. Well, 'huge' is relative in this case. I was examining the water under the microscope and the eye could not have been larger then a quarter of a millimetre. But it was 'huge' in another sense. 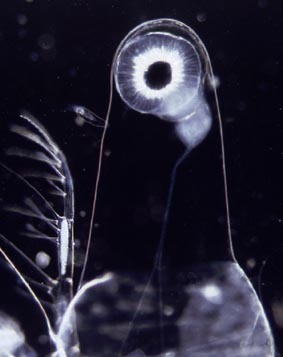 It was clearly the eye of a water flea.In water fleas the two eyes are fused together to form one large faceted eye. But the body that belonged to this eye was so transparent that is was almost invisible. I changed the lighting of my microscope into dark field illumination. Then the body of this giant wate rflea became visible. Unlike normal water fleas it lacked the characteristic shell, the 'Carapace'. The creature was extremely elongated. The body size was incredible, almost two centimetres. I tried to photograph the organism but it was too large to fit the frame of my camera. I reexamined the water that I had collected with a plankton net but this time under a stereo (dissecting) microscope. This microscope gives less illumination then a light microscope but gives stereoscopic vision. Now I could see the whole animal. The giant water flea Leptodora kindtii is so transpaeant you will hardly notice it. It is mostly the movement of the locomotory antennae that gives away it's presence. The transparency makes Leptodora not only invisible for predators but also for it's prey. It will eat all kinds of other animals but since it does not posses strong jaws it is unable to eat organisms with a hard shell. To photograph the whole animal under the microscope I used a young animal that was small enough. The reproduction of Leptodora differs slightly from other water fleas. 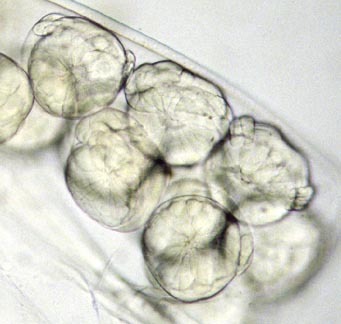 The eggs develop into Nauplius larvae instead of into a miniature adult. The left image shows the brood pouch with eggs developing into larvae. Published in the July 1999 edition of Micscape Magazine.